I love making itineraries, for me or for others. I have fun with it, but I know many people hate it, just don’t have patience for it or don’t know how to do it. I often get asked for advice on itineraries, information regarding how many days to stay in a certain place, the best transportation, how feasible it is to do London, Paris and Rome in 10 days, and so on. Being a crazy planner and an addict to itineraries, from now on, you will find more often around here some of my suggestions. 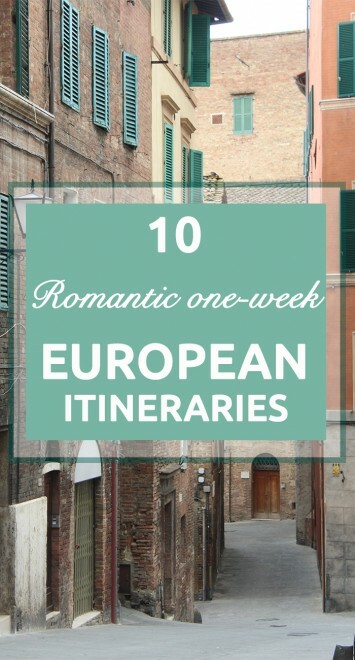 To begin, I put together 10 romantic one-week European itineraries, for those having a short time to enjoy the old continent. The good news? None of the itineraries include flying between the places. 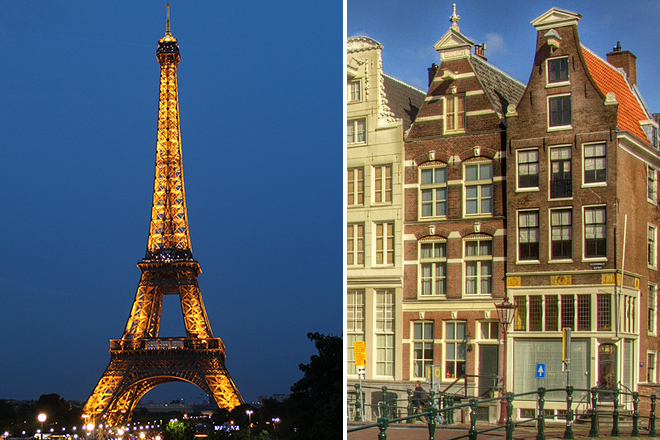 You could never go wrong combining these two amazing and romantic European cities. Both with lots to offer, where unforgettable moments are guaranteed. Enjoy Paris by walking by or taking a cruise on the seine, having a romantic dinner – it can be even baguette and wine sitting on the grass in front of the Eiffel Tower – strolling around the streets of Montmartre. In Amsterdam, get a bike and ride around the city, appreciate the tulips and taste some homemade cheese. Spend some quality time in France by combining Paris and Tours, the capital of the Vale du Loire, or should I say the capital of castles? After exploring the city of lights, escape to a stunning region filled with fairy tale castles. Absolutely romantic. What’s better than combining one of the most amazing cities in the world with an island? Well, in Italy that’s possible. Spend some days exploring Rome, indulging in rich history and Italian food, and then take a break at the charming and unique Capri Island and its blue grotto. Many tour operators will offer you a day trip to the island, but trust me, it is not enough. This little paradise deserves much more than a day to be fully appreciated. And if romance is what you are looking for, this island can certainly provide the perfect scenario. 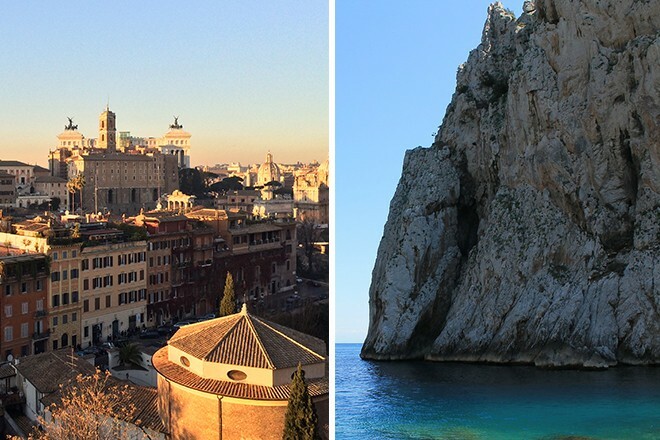 Take a train or drive from Rome to Naples, and then take the ferry to the island. You can even squeeze in Naples on your itinerary, and a famous Pizza Napolitana. 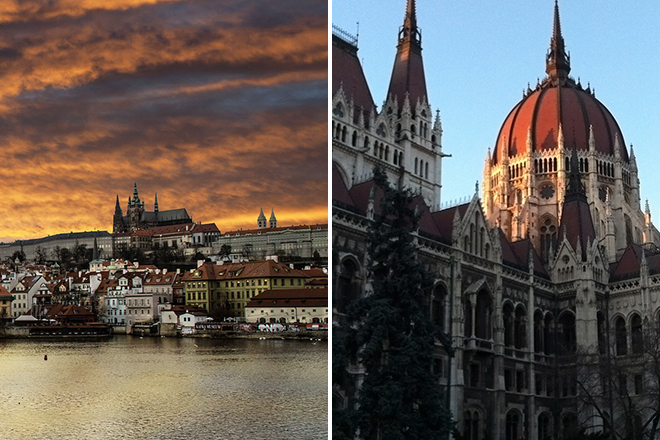 These 3 cities combined can only result in romance, and you will be blown away by the landscape on your way travelling between them. 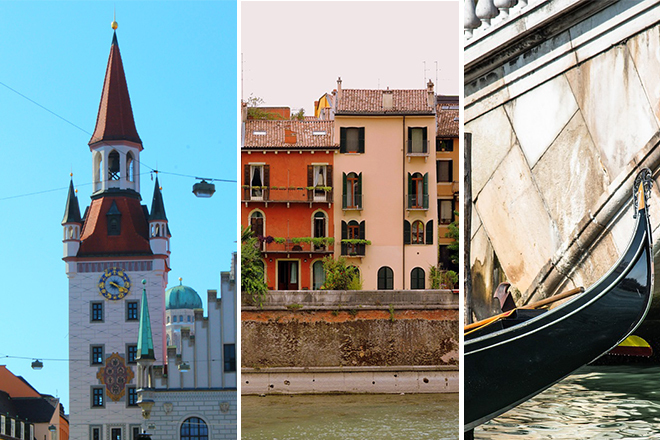 Munich is more romantic than what many might expect, in Verona you will find Juliet’s balcony – yes, Juliet from Romeo and Juliet, and Venice, well, Venice is Venice, it is famous for many reasons. Tip: I recommend starting and finishing your trip in Munich. 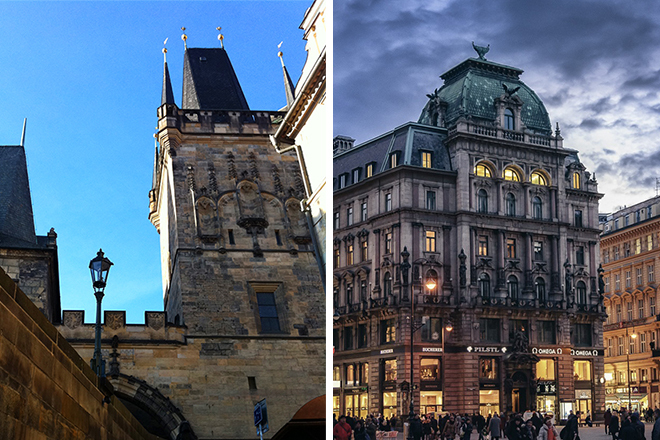 Prague and Vienna are pretty close and very easy to travel between. One week can certainly provide a quality time to explore both and fall in love with them. The medieval Prague with its enchanting old town, great prices, and food, provides a breathtaking scenario for romance. Vienna with its palaces, operas, parks and carriages, what’s not to like? This is an itinerary for the ones with no rush. The perfect itinerary for those wanting to squeeze in as much romance as possible. Start the trip in Vienna, head to lovely Salzburg where you will learn more about Wolfgang Mozart’s life and maybe try the famous Sacher Torte. Finish you trip in Munich, from where you can take a day trip to see the Fairy Tale castle Neuschwanstein. Note: if you have the option to arrive in Vienna and leave from Munich, even better. 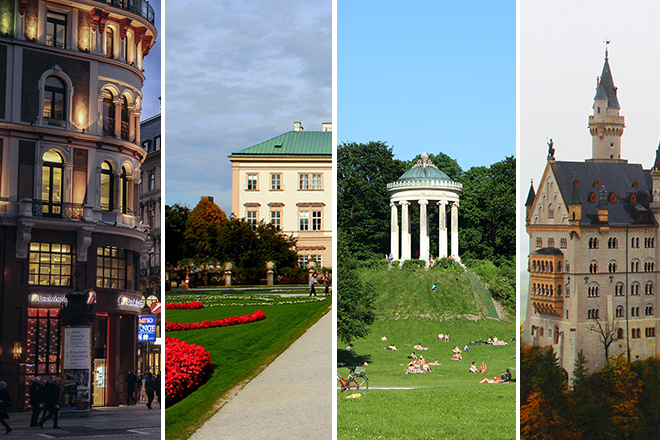 Romantic Vienna has a great location, just like Munich, and from there you can make some great itineraries. This one includes the lovely and underestimated capital of Slovenia, Ljubljana. This small town is considered one of the most romantics in Europe, and I can tell you, it really is. From there you can visit the stunning turquoise Lake Bled, one of the most unbelievable places you will ever see. Note: I highly recommend renting a car in Vienna. The road is easy to drive and you will save a lot of time. 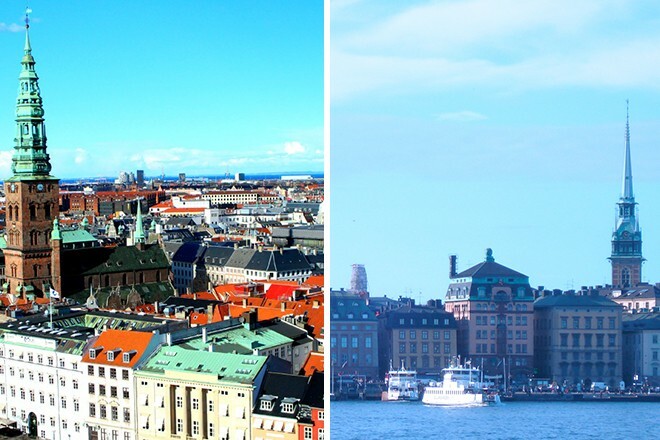 Ahhh these two cities, how not to fall in love with them? One more romantic and stunning than the other, not to mention how cheap they are for travellers. You can start the trip in any of them, whichever works best for your flights. Both are great for foodies – don’t forget to try Goulash Soup. In Budapest hike up the Citadel for a stunning view over town, and have a romantic dinner by the Danube. For me, it’s impossible to leave Scandinavia out of romantic places. It seems like Copenhagen and Stockholm came out of storybooks, with their colourful buildings, boats, architecture, and water canals. Stockholm has a very special place in my heart; it’s one of the most amazing places I have ever visited. 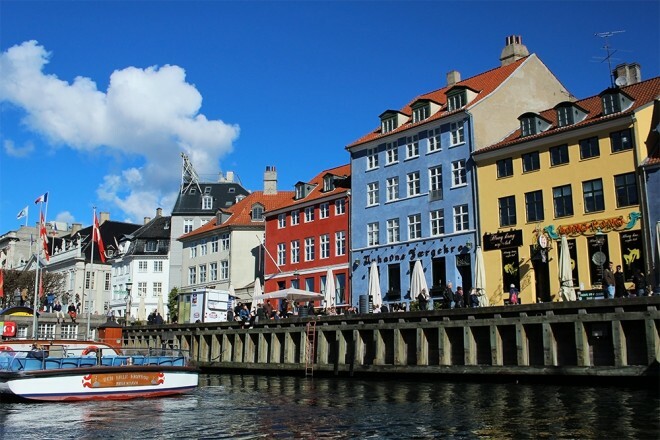 Tip: start the trip in Copenhagen – trust me, you are going to thank me later – and if possible, try to arrive there and depart from Stockholm. Train is the best option to travel between them, not to mention, stunning. What’s not to love about this itinerary? Wine, amazing landscape, olive oil, Italian food, medieval towns, narrow streets, history, Vespas and bikes. 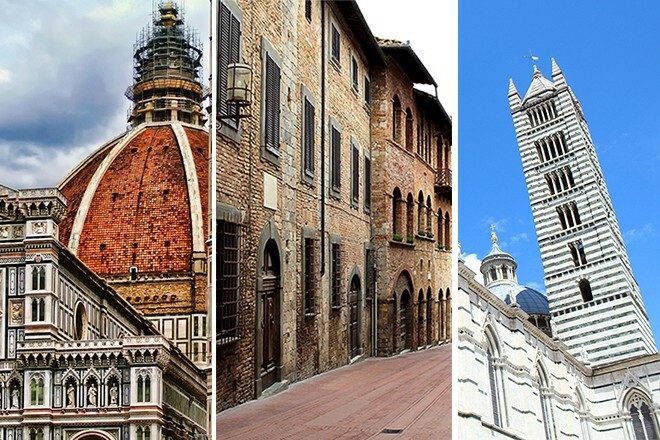 If you had to pick only 3 cities to visit in Tuscany, these would be my recommendation to you. The combination of relaxation, delicious tastes, breathtaking views, and romance in one itinerary. My advice is: arrive in Florence, rent a car and go explore all the way down to Siena and on the way back stop in San Gimignano. Definitely rent a car, it will give you more freedom to explore other cities and villages in the Tuscan region. Nothing compared with taking day tours. Around 3 hours all together + the extra time exploring the region (a must). Found it useful? Pin it for later! Ohh any tips are very much appreciated! Thank you! Thank you dear!! Happy that you liked it. And yes, it’s very easy to get to Verona from Munich, and the landscape is amazing! Every time we drive to Italy we take this way through Verona! I love it! Coincidência que achou meu blog e que tens um namorado alemão aqui de Munique!! Já veio aqui antes? Vai adorar! Espero que faça uma boa viagem e aproveita Munique! 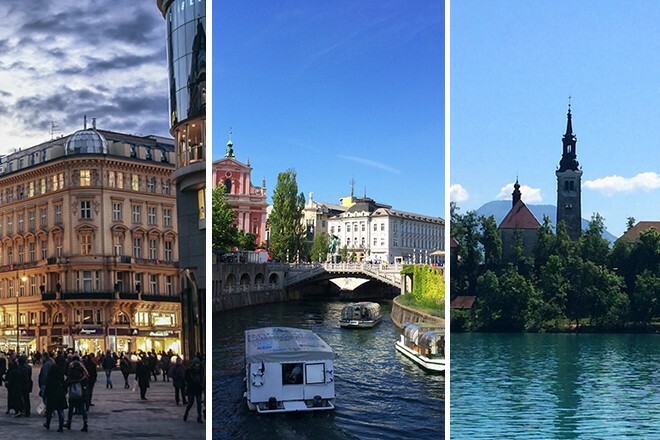 Yes, Ljubljana and Croatia, but Croatia deserves more than just a few days, so this itinerary will come up for 10 days or 2 weeks or so 😀 what do you think? So many options! Always makes me jealous to not live in the heart of Europe and have all of this at arm’s length. 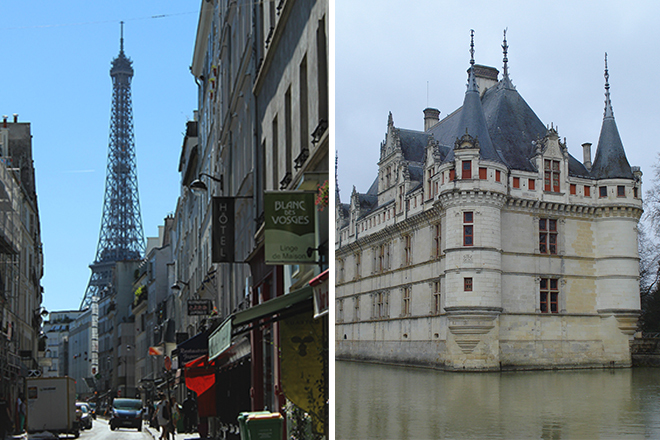 I must say that I really loved the Loire Valley and Tours – very romantic! Yes, the Loire Valley is amazing!! I hope I can get back there again!